My office uniform is dress trousers, t-shirts and scarves or statement necklaces. In winter I add a jacket. It's not really a suitable look for interviews. Plus my t-shirts are all a little worse for the wear after a year of home renovations. On Friday I trotted off the shops, full of expectations of being able to buy a shirt to go with my black interview skirt. I look for four things in my clothes - colour, style, sleeves, and fabric that doesn't make my skin crawl. It would seem I can get two, at a stretch three, of those in any one garment. If it had sleeves, style and decent fabric it only came in black or white. Black with black - blurgh. White shirt on the way to an interview - now there's a recipe for disaster. If it was coloured (and not orange, which seems to be all the rage these days) it had no sleeves, or felt like hessian (or worse), or it was just plain ugly. I finally found a man's business shirt I thought I could adapt. I tried it on over my rather large sweatshirt and decided it was fine. I was going to reshape it anyway, so it didn't matter if it didn't fit well. And at $16 it was a bargain. When I got it home I discovered several problems. It only just fit across the chest, which also caused rather ugly puckers near the armpits. It didn't quite button up across the hips. I wasn't keen on the stiff man's collar and the long sleeves. In fact, the only things it really had going for it were the colour, the fabric, the hidden buttons and the ribbon detailing. And the fact that I didn't have to cut out pattern pieces and sew it all together. I unstitched the collar, leaving just the band and cut off the sleeves to short sleeve length. I used a shirt I like as a guide for the sleeve length - lined up the armhole seam, pinned the shirts together, and laid my inch wide ruler at the end of the pattern-shirt's sleeve. This gave me an inch for hemming. Then the fun part - how to make it wider in parts, narrower in others and still look okay. I started by unstitching the side seam, including the sleeve. As a side note, years ago I got hold of a book in which the author said to forget about trying to fit sleeves to round arm holes. 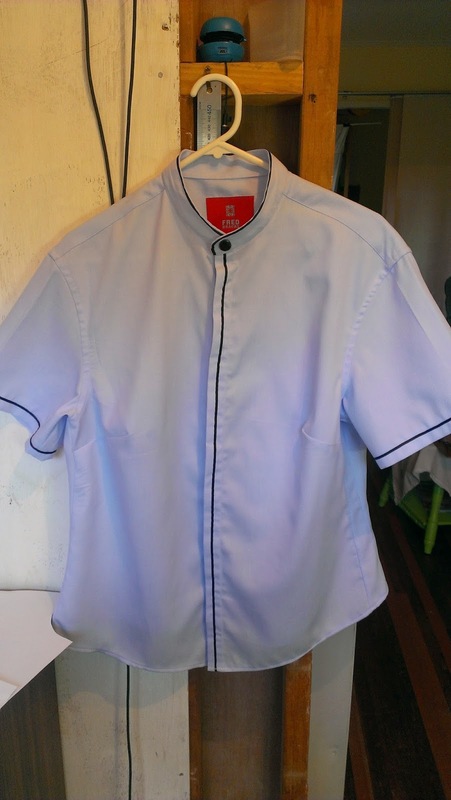 The standard advice on patterns is - sew the side seam, sew the sleeve seam, then fit the cylinder of the sleeve into the round hole of the shirt. 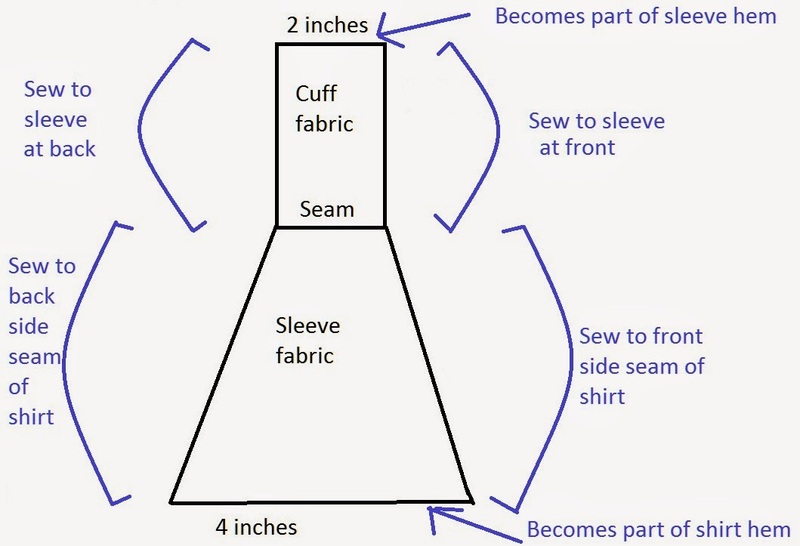 She recommends, sew the sleeve to the arm hole, then sew the side seam and sleeve seam in one go. 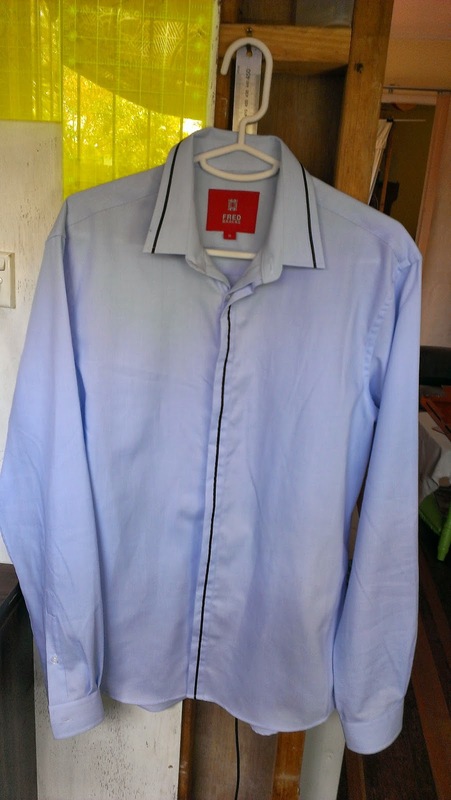 I've looked at all of hubby's dress shirts - they are all sewn like this. In fact, when I found the beginning of the chain stitch on this shirt and pulled - the whole seam, from shirt hem to sleeve hem, unravelled. I unpicked the seam on the sleeves ends I had cut off, and I unpicked the cuffs. I measured the shirt against a sloper pattern I have, which I know fits perfectly. I needed about 2 inches at the bust, nothing at the waist, and about 4 inches at the hips. Using the same sloper pattern, I placed bust darts. It was difficult to work out where to put the end, because the sloper obviously didn't line up exactly with the shoulders and arm hole edge. I ended up having to unpick them and move them about 3/4 of inch upwards and about an inch or so shorter. I used fabric from the cuffs (the un-stabilised side) and cut it 2 inches wide. I cut the sleeve cut offs 2 inches wide at one end, tapering out to 4 inches at the other end. The sleeve sections were shorter than the body of my shirt when I started, but once I had the bust darts in, they were almost the perfect length - serendipity. This new section and the bust darts meant the shirt fit in all the previously tight places, but it was pretty shapeless. Using the same sloper pattern, I folded my new side sections in half, and drew a waist shape line on them. I cut it then stitched it. The outside effect is to add a seam, the shape effect is to a add waist. Adding waist shaping. 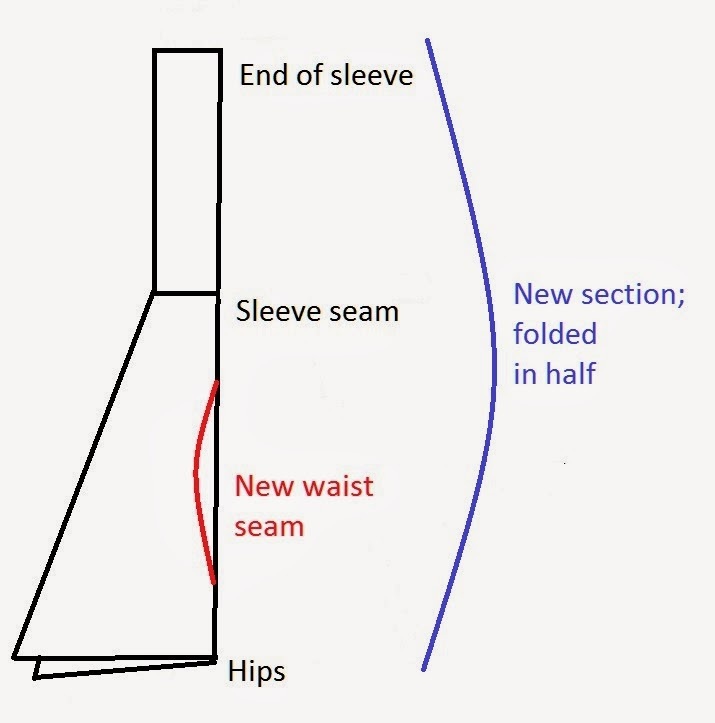 The new waist seam actually tapered away to nothing at the end of the fabric; not part-way up as shown on my drawing. 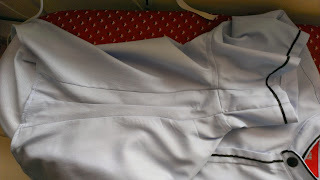 Side and sleeve insert, showing centre "seam" for waist shaping. Then it was simply a matter of resewing the band collar with ribbon detailing, changing the one visible white button with a black button, hemming the sleeves with ribbon detailing, and hemming the bottom. The bottom had to be reshaped, because the darts made the front a couple of inches shorter than back. I kept the same shape as the original by using the original hemline as a guide - just a couple of inches higher, and just tidied up the front. To cut the new hem, I folded the shirt in half - this helps keep both sides the same.